Previously, on MinerBumping... Harmony Order corporation found itself in a disastrous conflict with the New Order. 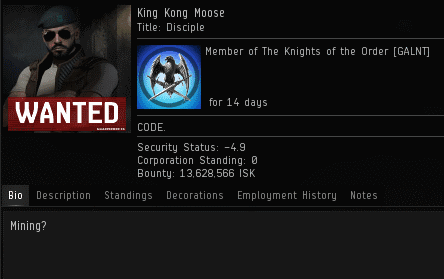 Only King Kong Moose was willing to fight anyone from the mighty CODE. alliance, but his duels resulted in repeated deaths. Meanwhile, other members of Harmony Order were also getting ganked. 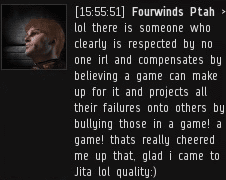 Generally speaking, there are two types of EVE players: Those who think the object of the game is to grind isk without interference from "bullies", and those who understand that EVE is a spaceship combat game. Because King Kong Moose was willing to engage in combat, Agent Viirilithizu Ward decided that he ought to lead Harmony Order. Viirilithizu notified King and Harmony Order's CEO, Governor MrLee, of her decision. Our Agent also coached her opponents on how best to make the war a fun experience for all. As we saw in the last part of this series, members of Harmony Order ended up on the receiving end of multiple ganks--despite Viirilithizu's advice. Meanwhile, King resumed his attempts to fight. He upgraded from a Federation Navy Comet to a Vexor Navy Issue, but Agents Ralliana and Luna Nightblood still bested him. "But James 315," says the rebellious carebear. "Two against one isn't fair odds! Your Agents have no honour!" In the next battle, King persuaded a friend to come along. Both members of Harmony Order were defeated by Ralliana on her own. So, carebear, do you still think two against one isn't fair odds? Later, King asked Ralliana for a rematch. Once again, the New Order was victorious. 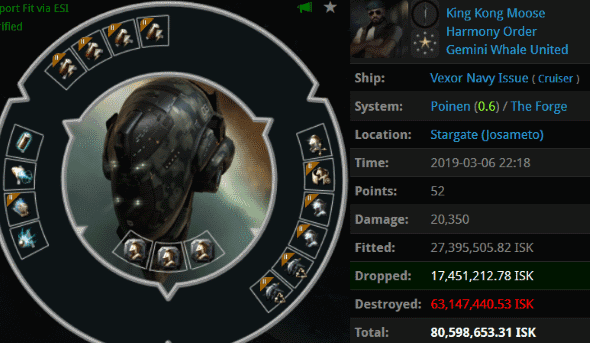 King wasn't the only one to die during the wardec, of course. Whenever someone from Harmony Order couldn't resist undocking, they suffered the same fate. So far, things weren't going well for Harmony Order. In fact, the war was completely one-sided, with CODE. winning each and every engagement. 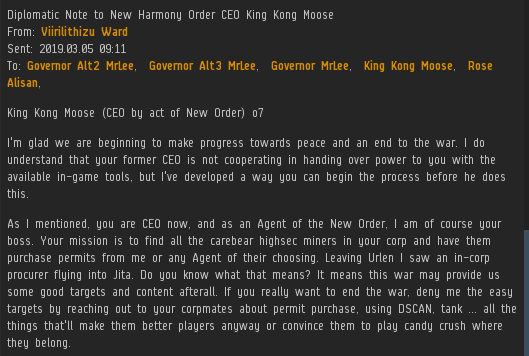 Because his corp's leaders were silent, and because he felt like it, King responded to Viirilithizu's EVEmail from earlier. Then he geared up for another battle. 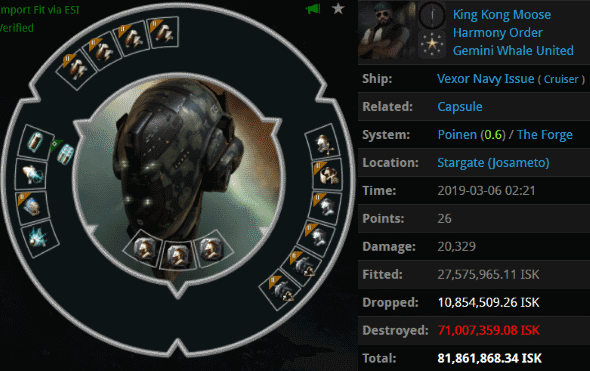 This time, he spent a bit more isk on his Navy Vexor fit. Nevertheless, he did not have the Code on his side. 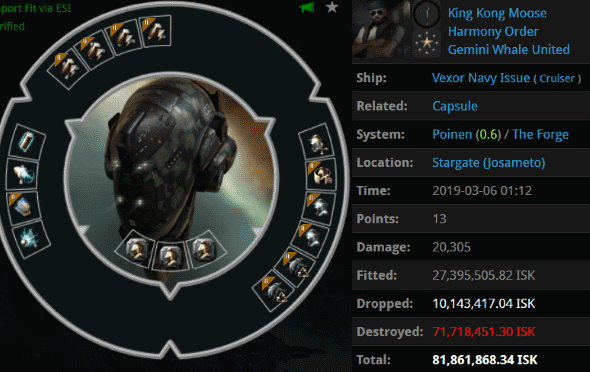 Agent Othya's Sin destroyed yet another of King's ships. Just when it seemed that King would never give up, our Agents learned that he was no longer a valid war target. He wasn't in Harmony Order! Much speculation followed: Had he been kicked out of the corp for intentionally participating in EVE instead of remaining docked up? But would Harmony Order really become stronger without its only committed PvP'er? Whoa! The Scourge of the Secure Container turns? This must be a ruse. Or just a case of superficial understanding of The Code? So exciting, can't wait to see how it turns out! Strength and best of luck for agent Moose! I'd hate to see him relapse like the others..
Rather than blame his defeat on "a few minor skills", 'Moose' would do well do accept his monumental failure is the consequence of both Agent Ward's splendid diplomatic work, and Agent Ralliana's elite PVP. Crazy plot twist! James should make this into an animated cartoon series. As a sandbox in space mining, trading, and manufacturing are perfectly legitimate professions. 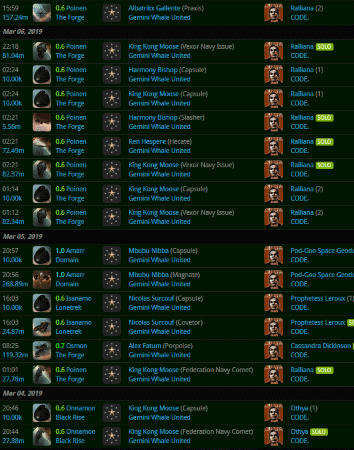 They should be protected in order to ensure CCP's profits. The same can be said about ganking and wardeccing. You can play however you want in the sandbox—and so can your hunters. Unwarranted aggression is against the ZAP, a principle all human beings should strive to follow. Even in video games, virtual aggression is harmful, and corrupts those who partake. Have fun playing Meow Meow Star Acres. I don't own a cell phone or anything made by apple. Sorry. Agent Moose! It's alarming that you didn't leave your carebear corp willingly. Perhaps you joined CODE. to spite your former friends? You wouldn't be the first. May your conduct be reflective of the fine principles of our esteemed organization. Welcome to the brotherhood, King! This story makes me smile. I hope to gank with you some time in the future. This story line has overstayed its welcome. The villans (Harmony Order) won't play and the heroes have nothing to do. Stretching the thin and predictable plot is sending the audience to sleep and the ratings show it. Verdict: Get a script doctor and reboot the entire show. Strange, I have noticed a few hundred millions worth of playing from Harmony in the article. And one of the villains is a turncoat! Exciting stuff. 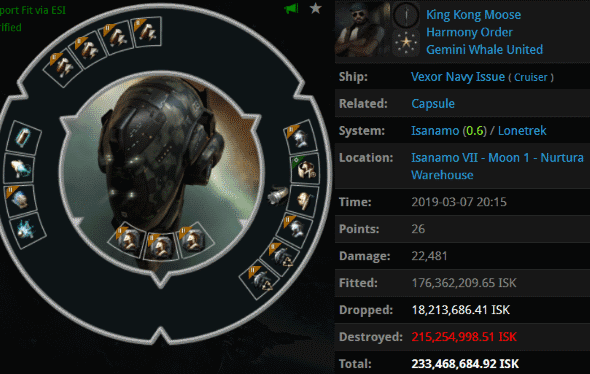 Harmony Order has fractured and they created a new corp called Absolute Order, their alliance also switched from wardeckable to un-wardeckable several times after CODE. 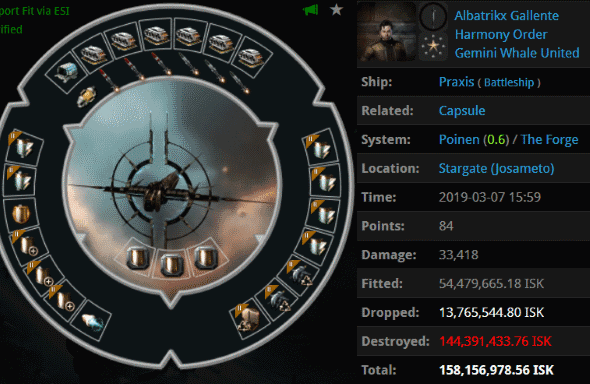 declared war, we can see this carebear corp as "finally showing their true color" meanwhile in other news, a lot of former Harmony Order are evacuating to FW space as an LP farmer mostly. Why doesn't Jamey and his chode. slaves venture into low security space and hunt these legions of risk adverse, bot-aspirant LP farmers? They can make as much ISK as a miner in high security space. You know the answer to that ChodeAnon. 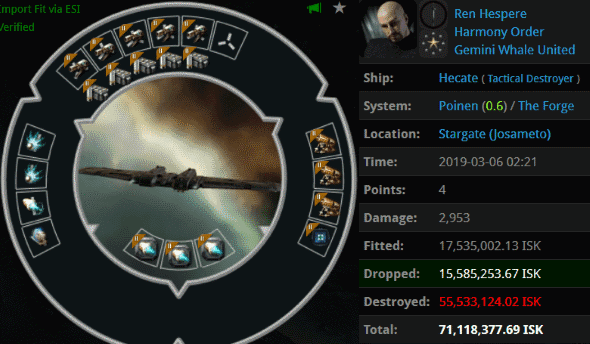 Highsec hasn't been saved yet. Buy more New Order shares! 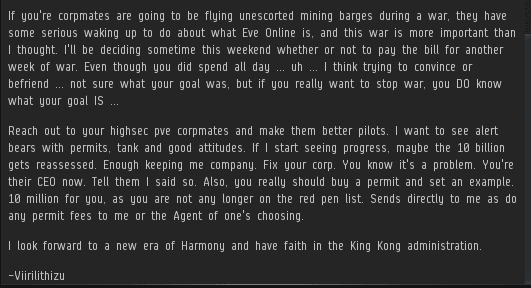 It will save highsec soon if you wish lowsec to be saved. Praise James for agent King! Master vexor ganker and bane of miners everywhere!